MIAMI BEACH – One of the more confusing moments in renting a car is the moment in time when the rental agent tries to sell you insurance on the rental. What should you do? If you have insurance on your personal car and it provides rental coverage, usually the answer is “no” because it would be a waste of money. That doesn’t mean that you will be covered for everything that happnes. 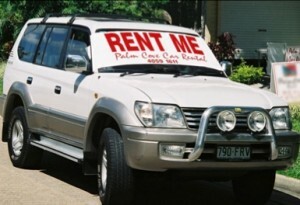 But, chances are that if you have your own coverage, buying additional coverage sold by the rental comapny is a waste. But read below to make sure. The rental agencies will try to sell you two things. The first is loss damage waiver. And the second is liability insurance. There are other coverages that they may try to sell. But these two are the basics and this article is limited to discussing the pros and cons of purchasing them depending on what coverage you have. Loss damage waiver would protect you against any losses assocaited with the phyiscal car. This includes damage, destruction, stealing or theft, hail damage, dings, dents, glass shattering, or any other physical damage to the car. Liability Insurance protects you against someone suing you for causing an accident and hurting them. You need to know what type of insurance coverage you have on your own personal automobile before you make a decision on this topic. If you do not have a personal automobile with insurance coverage, you should probably purchase both of the above coverages and get a form of personal injury protection and uninsured motorist coverage. If you don’t, you could be on the hook for all dings, scratches, damage to the car, injuries to others in an accident, repairs, and a host of other damages caused by an accident. However, if you have coverage on your personal automobile and have already decided what is appropriate for your personal automobile, you will probably not need to buy additional insurance. Still, you should call your agent and see what you have on your own policy before renting a car and deciding what additional coverages to purchase. You can also buy coverage from your credit card company. That’s right. Your credit card company may provide rental car coverage automatically with your rental or upon purchase. It has its limitations as far as how extensive the periods of time are it will cover. But in many cases, it is much cheaper. Call your credit card company and see what they offer. The simplest advice that can be given is that only buy rental insurance from the agency if you don’t have your own insurance or your insurance does not cover rentals, has a large deductible, or does not include collision coverage or enough coverage for physical coverage to the car itself. Now, as a caveat, remember that you must call your car rental agent before making any decisions above. He or she can tell you what is in your best interest most of the time based on what coverage you have. And, this sort of a decision is always based on one’s tolerance for risk. As an aside, it used to be that, in Florida, as a dangerous instrumentality state, the rental car company had to pay for any damages and injuries arising out of the negligence of the driver of a vehicle they rent. This had a limit of around $600,000.00. So, at that point, buying liability insurance was a complete waste whether you had a car with insurance or not. But, under the Transportation Bill, which was signed into law by George W. Bush as president, this was eliminated. If you cause damage to another and are uninsured in the rental car, the Transportation Bill is currently interpreted to provide for only $10,000.00 in coverage to others. Be careful, though, if you don’t have insurance and plan on waiving liability with the thought that you can rely on that $10,000.00 to pay for another’s injuries or damages. If the car rental company has to pay that out, they can come against you to get the money they pay out back under the legal tool called “contribution or indemnity” which are both part of the common law of Florida and likely stuffed into the rental contract you sign. If you have any questions once you have spoken with your car insurance agent, we don’t mind answering these sorts of inquiries for free. It is our pleasure to help you make a wise decision to protect yourself and your family before you embark upon renting a car. Most importantly, if you are renting a car for vacation purposes – be safe and have fun!